The great pleasure of Alpine cooking does not lie in any rough rusticity exalting the good old days or in the over-sophistication of certain culinary show-offs. For high-altitude gourmets, « simple, tasty and pleasing to the eye » is much more to the point. The « pork feast » is a major yearly event in the lives of the people in the southern Alps. A basic staple, with bread and potatoes, pork is celebrated during feasts bringing together the entire community, according to dates in which pagan rituals often play havoc with church holidays. A tradition bearing witness to the strong identity of the inhabitants in this southern part of the range. Thrush pâté flavoured with juniper berries is but a memory. Now forbidden, the ingenious lecque, a simple trap, may no longer be found throughout the southern Alps. And the meal from the skies has disappeared from local plates. Or some, anyway. The diot bauju sausage, so original and yet a moment forgotten, continues to delight the inhabitants of the small Bauges region in the Savoy. Made in homes and small shops, using fat and green cabbage, its production carries on in spite of all odds. An archaic tradition or a true pleasure ? Alpine cold-cuts form a vast family. From one end of the range to the other, there are no limits to the variety of ways pork is cured and prepared. In the Savoy, in particular, where each region combines ingredients, techniques and specific tastes to offer a wealth of local specialities. Curing meat without smoking it is an ancient technique used in certain mountain regions. The product of old know-how and preciously guarded recipes, the dried meat of the Valais region has become a highly appreciated local speciality. Though less well known than the Grisons or the Bresaola in Italy, its authenticity should soon be officially recognised. Bear steak, which the author of the Three Musketeers is said to have tasted himself during a stay at an inn in Martigny, Switzerland, elicited numerous reactions during the 1800s. It must be said that the man was, above all, a magnificent story teller. The writer and his views. Coming from Italy, pasta has conquered much of the Alps. Long a household production, with each local variety harking back to the common ancestor, it has over the past century become a great industrial success. Following the example of Lustucru, the giant from Grenoble, many producers have now carved out a spot on the market, a reminder of the historic standing of pasta in Alpine regions. On the wedding photo stands a woman with a white apron. 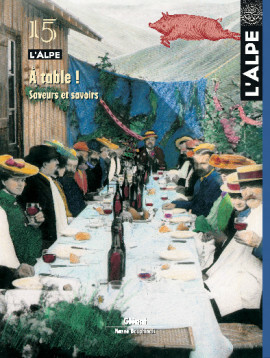 She is the « ravioleuse », the organiser of banquets in the Royans region and around Romans, in the Dauphiné. A variety of the Italian course, ravioles were long considered a choice dish, reserved for important occasions. And it was not always easy to line up the services of the women who held all the secrets. In the Savoy, potatoes have become, over the centuries, the favourite vegetable for large family meals. Whether cooked under the coals or set simmering for hours, potatoes take part in an array of hearty dishes limited only by the imagination of the cooks. Though the péla is now called tartiflette and delights the tourist crowd, the many other uses constitute a reserve of culinary pleasures. The sharing of bread, leaven and labour. The eternal acts, repeated on end by countless generations. In mountain regions, the periodic cooking of bread brought the community together in a warm and lively circle, time and again. An ancient custom ripe with meaning for those capable of deciphering the many signs. Perch fillets on the shores of Lake Geneva or panned pollan from Lake Annecy (with, of course, a pleasant, local white wine) are among the culinary delights of the Alps. A long-standing tradition, fishing represents a non-negligible activity in these mountain regions where the fish have earned an excellent reputation. What conclusions may be drawn from the staple fare of the Vaudois and the Valaisan cantons even today ? From the leak papets on the one hand and the dried meat on the other, the differences in taste and the selected ingredients spell out the clear attachment of each canton to its culture, religion and family lifestyle. Tell me what you eat and I will tell you who you are. Cheese is up to your wildest fantasies. All you need is a touch of imagination and a whiff of audacity ! The vast array of Alpine products form a kaleidoscope of possible combinations of textures, savours and colours. The few, highly original recipes here are just a start and an invitation to explore the unimaginable wealth of culinary possibilities. Flavours from afar and way back when brighten the daily life of linguistic minorities in the Italian Alps. Mixing Occitan, Germanic or Slovene culinary traditions, the scarce resources of their land and wild grasses, these groups add a different touch to Alpine gastronomy. An inventive and above all preserved form of cuisine, similar to their cultural identity, it is just now starting to become more widely known. It is by the basketful that these tasty tidbits were devoured. The golden fritters are the stuff of festive moments and long winter evenings. In different forms and under various names, they continue to delight one and all during Carnival and are one of the few Alpine sweets. The image, a long string of cows on the path to the upper pastures, hangs above the barn doors in the Gruyère region. Poyas, an original form of popular art, express the profound attachment of farmers to the making of cheese up in the Alpine reaches. A lifestyle that is an integral part of the area. It was the English who first penned their impressions. In the Victorian era, while the members of the Alpine Club were racking up the summits, the public, enchanted with their heroic accounts, invaded the lower regions. From the Grand Tour to tourism, the story on how the British invented the modern concept of mountains. Text drawn from the Alpine Encyclopaedic Dictionary to be published by Glénat.